On Holy Monday there is a Bridegroom Service - Bridegroom Services instruct us in our faith, as does all the preparation for Holy Week. 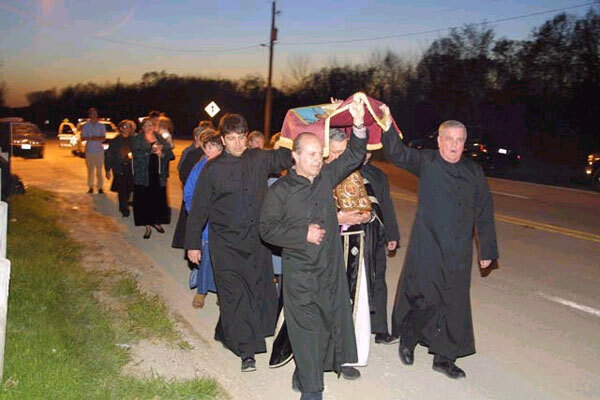 Even more they help us to make Holy Week more than simply a ritual that tells a story. 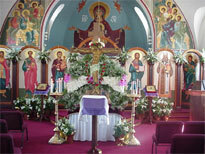 The Bridegroom Services help us to enter into the story, the life of Jesus Christ, and live it. Monday's Gospel lesson is Matthew 22: 15-46 and 23: 1-30. 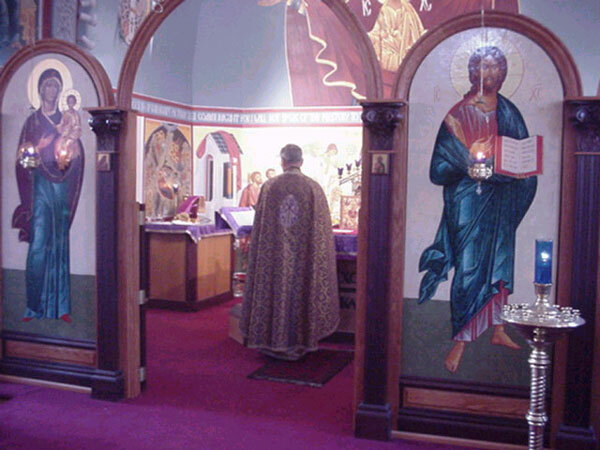 "Woe unto you Scribes and Pharisees, Hypocrites"
Tuesday's Bridegroom Service with the procession of the hymn of St. Cassian describes the life and conversion of the sinful woman who anointed Christ. The congregation is blessed with rose water. The rose water is symbolic of the sweet smelling myrrh with which the sinful woman anointed Christ. The scriptures tell us that the whole room was filled with the scent of myrrh. Once again it is important to understand that this is simply not a play being reenacted, but rather we are attempting to enter the life of Christ. The symbolic acts in the services draw us unto the life of Christ. Through these acts we venerate the individuals that these acts depict. John 12:17-50 "The hour has come for the son to be glorified." 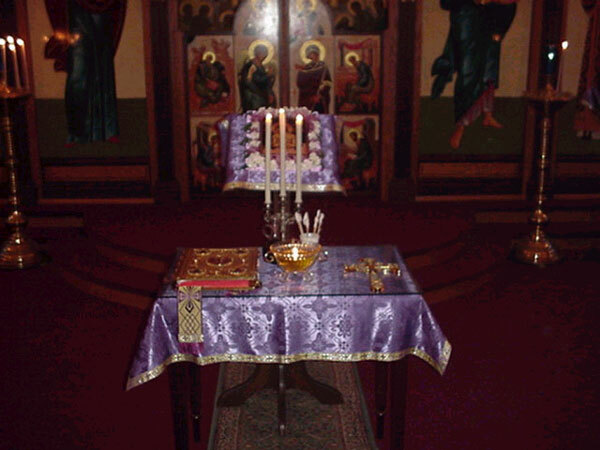 Sacrament of Holy Unction - The Church is called the Body of Christ. 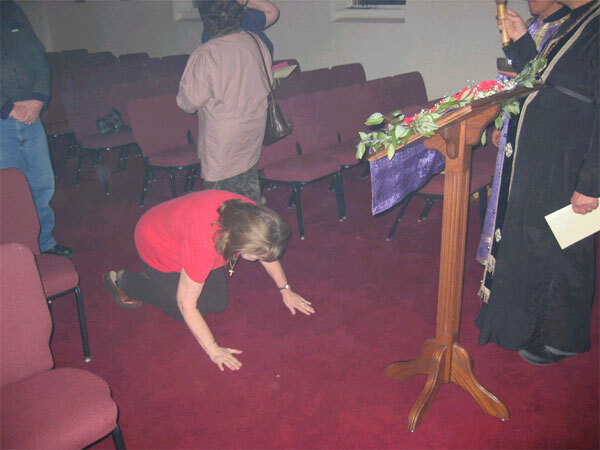 We are members of the Body through our Baptism, Chrismation, Confession, and Holy Communion. As the sinful woman anointed Christ, we are also anointed with the oil of healing, so we can go with Christ to the Cross, suffer, die, and be resurrected with Him. 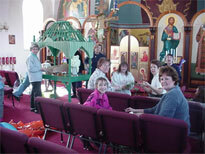 During the service all who are in need of special healing gather together in the center of the church. 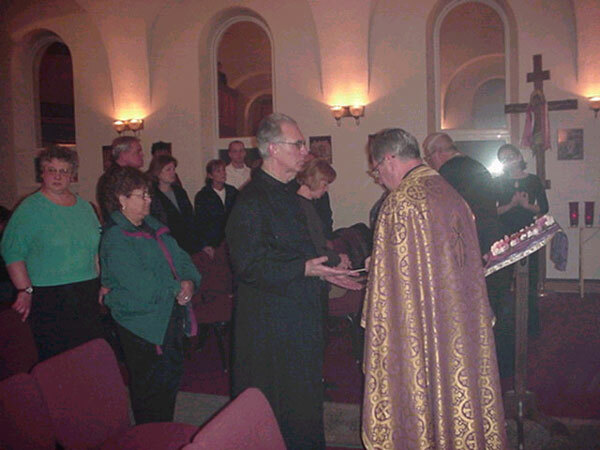 The priest holds the open Gospel over them and reads the Prayer of Absolution. 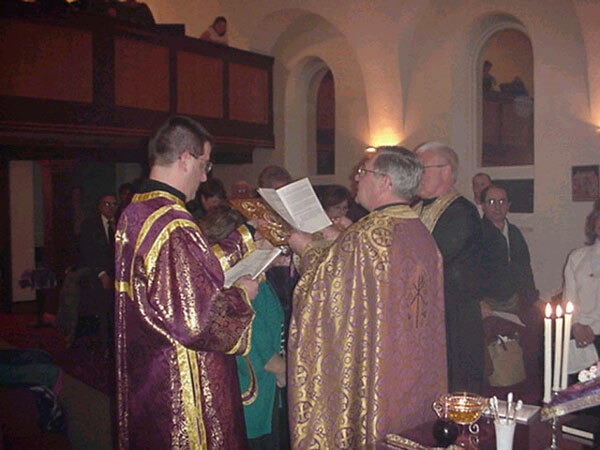 At the conclusion of the service, the faithful are anointed with the sacrament of Holy Unction. 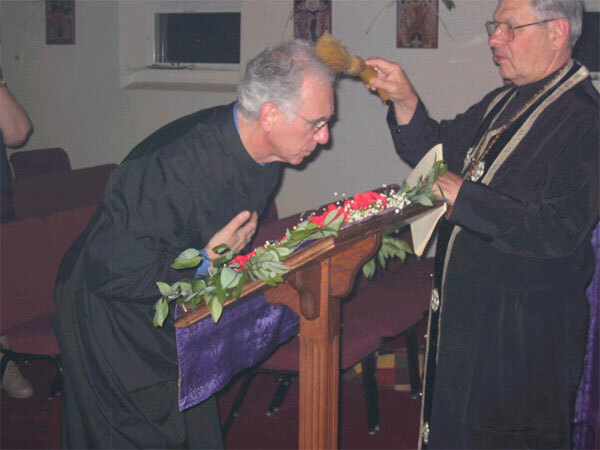 The priest anointes each of the faithful with the oil of healing on various parts of the body: forehead, eyes, ears, mouth, chest, palm, and the back of each hand. These areas are associated with the senses of smell, hearing, taste, and touch. The neck or chest is anointed for breath and for the heart. Epistle and Gospel lessons regarding healing are read. "The prayer of the faithful will save the sick." (James 5:15) We prepare for this service by prayer and fasting from noon. 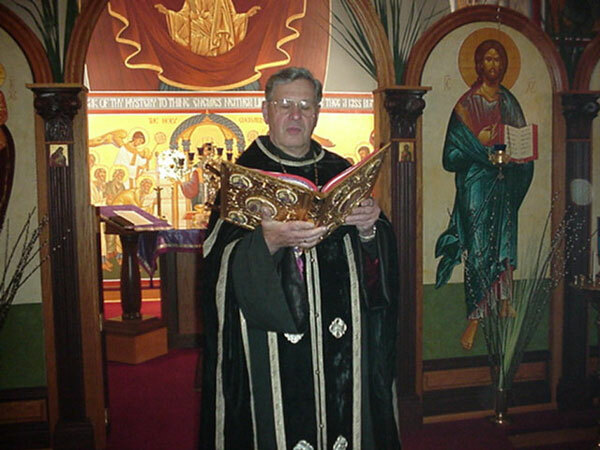 Vesperal Liturgy of St. 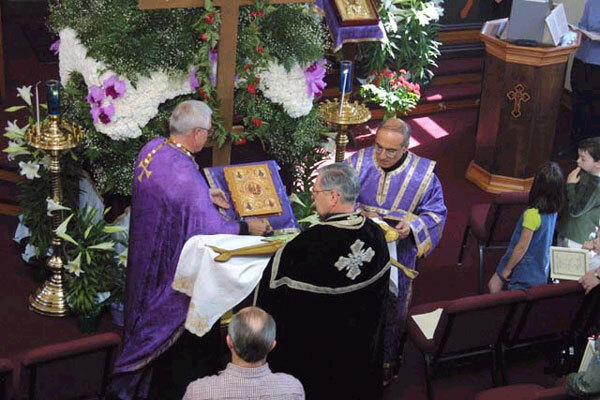 Basil - This service relives the Lord's Supper and betrayal by Judas. 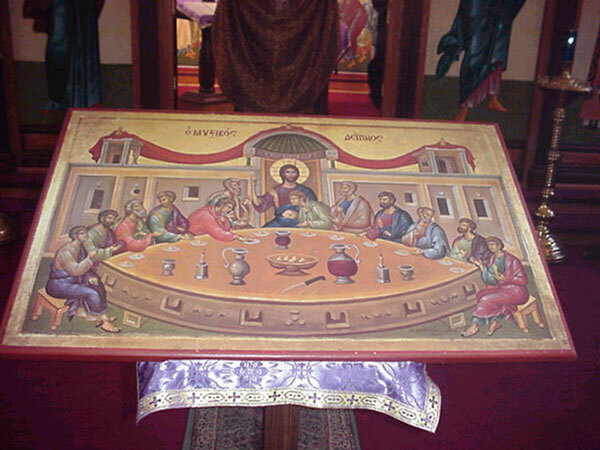 The hymn "Of Your Mystical Supper, O Son of God" is sung throughout the service. At the conclusion of the service, breakfast is served as an agape meal. 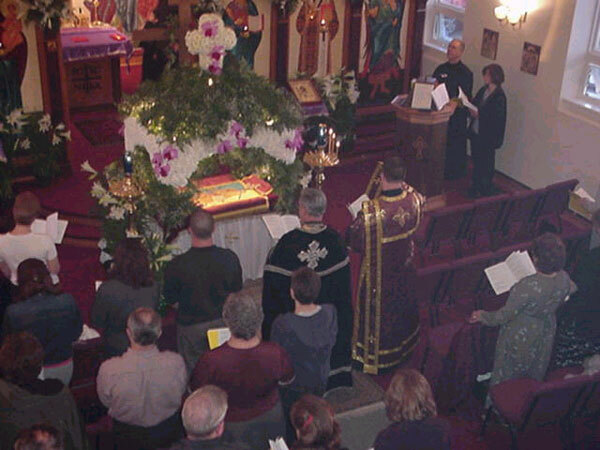 Passion Gospel Service - This is one of the most important and solemn Holy Week services. It is a remembrance and an entrance into the suffering and death of Christ. 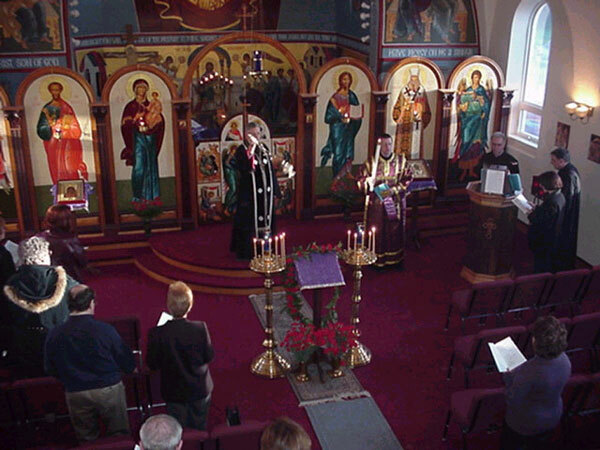 The priest, standing in the center of the church surrounded by twelve lighted candles, reads the words of the apostles who witnessed the events. 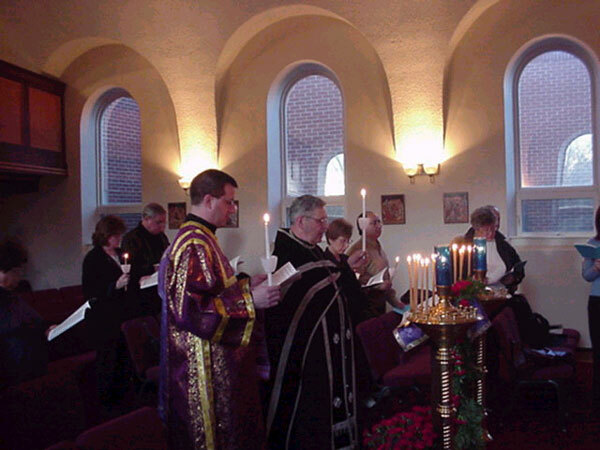 As each Gospel is read one candle is extinguished. During the fifth reading, the priest processes with the Cross carried his shoulder as he chants, "He who hung the earth upon the waters is now being hung on the cross." As Simon carried the cross for Christ during his walk to the crucifixion, the priest now carries the cross. In doing so here presents the entire congregation. 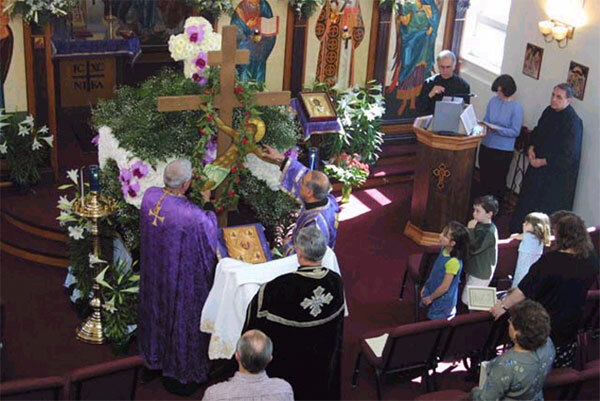 At the point of the sixth Gospel when "He yielded up the spirit" is read, the priest places a wreath of red flowers over the cross." (This is the moment in the scripture reading when Christ died). 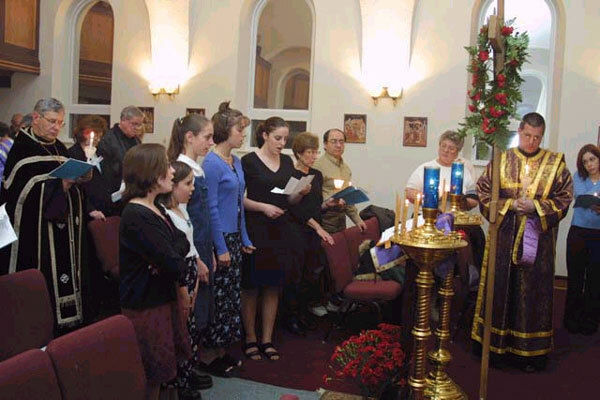 Following the placing of the wreath, several of the young ladies of the congregation sang the hymn "The Good Thief" in remembrance of the thief who was crucified with Christ and accepted Him while on the cross. Following the crucifiction, the myrrh bearing women prepared the tomb and Christ for burial. 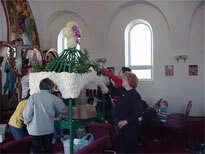 The women of the parish decorate the tomb of Christ with flowers. 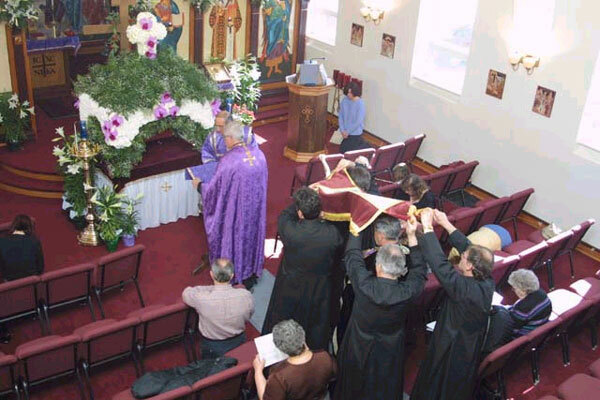 Procession with the Burial Shroud - At this service the icon of Christ is removed from the Cross as the priest reads,"And taking Him down they wrapped Him in a linen shroud." 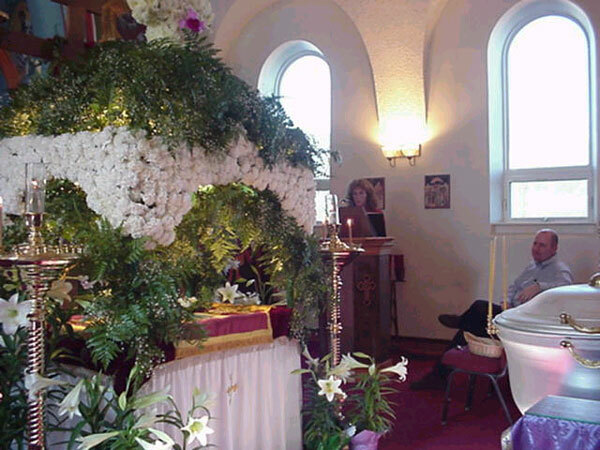 The tomb prepared by the women stands empty in the center of the church. The shroud is carried by four men over the head of the priest who is carrying the gospel as the choir sings the "Hymn of Noble Joseph". 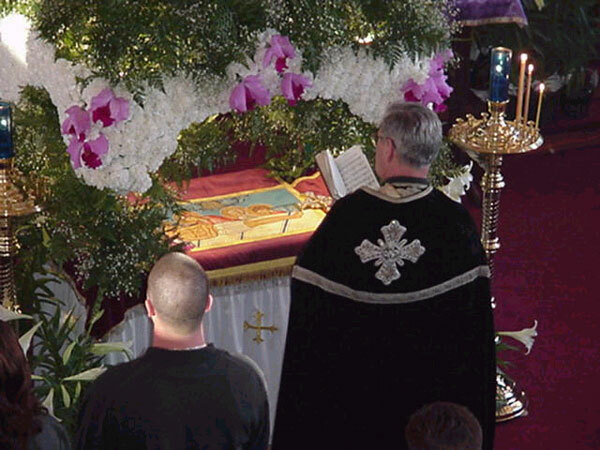 The procession ends as the shroud is placed in the flower-decorated tomb. 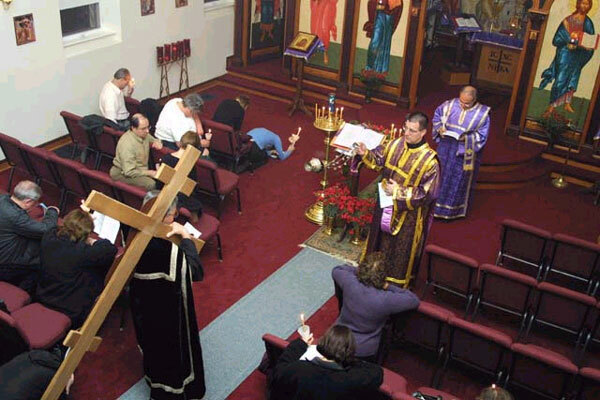 While the lamentations of the Virgin Mary are sung, the faithful make a prostration before thetomb and kiss the wounds on the figure of Christ on the shroud. The Lamentations - As the name suggests the service is a mournful one lamenting the death of Christ. Psalm 119 "Blessed are those who walk in the law of the Lord." is chanted by the priest. The refrains are sung by the congregation, "O Life, how can You die?". 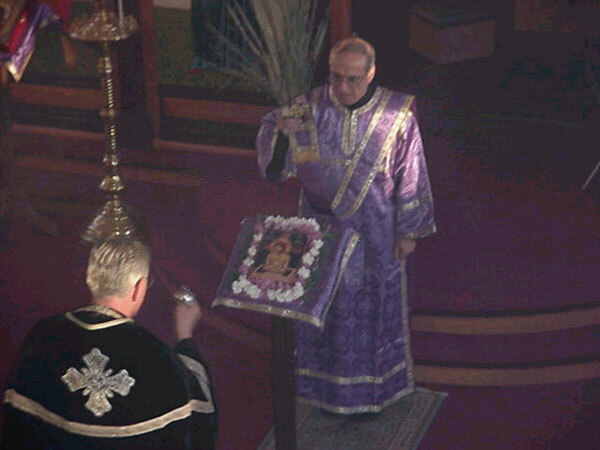 During the singing of the 9th ode of the Canon, the priest blesses the congregation with rose water as rose pedals are scattered around the church. 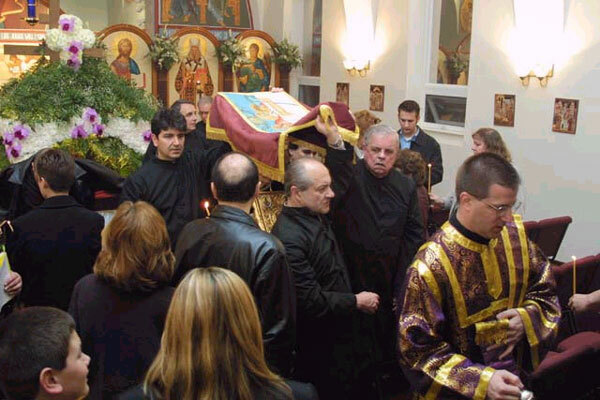 During the service, the shroud is removed from the tomb and four men along with the priest, choir and entire congregation make a procession around the entire exterior of the church while the "Hymn of Noble Joseph" is sung. 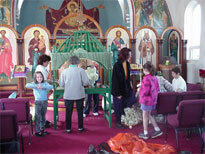 They return to the church to hear the reading Ezekiel about the valley of the dry bones. 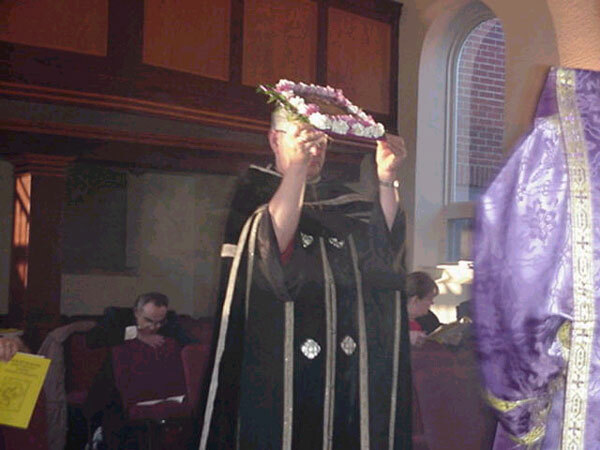 The service ends with the veneration of the shroud and the distribution of flowers. 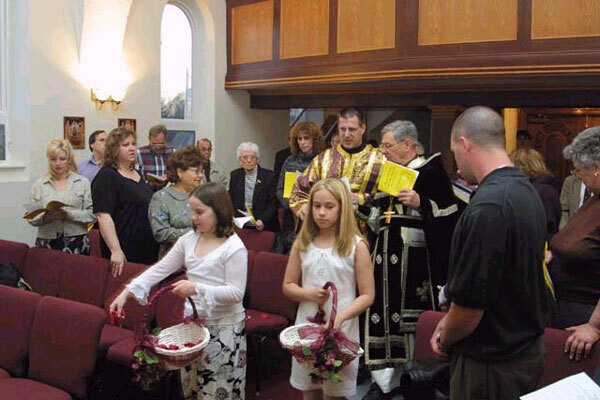 Immediately following this service the vigil of the tomb begins and continues all the way up to Saturday morning. 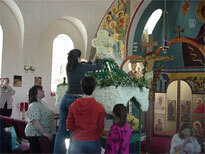 Following the Lamentations on Friday night, parishioners volunteer to stand watch and "guard" the tomb of our Lord. 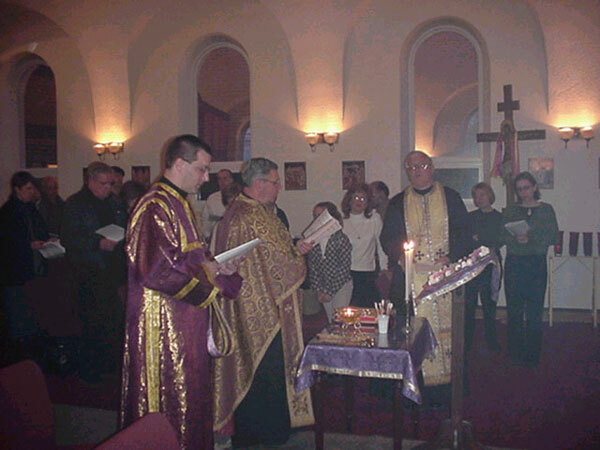 This vigil lasts for 24 hours until the Pashcal services the following night. The church remains open during this time for visitors to come and worship before the tomb. The mood is that of a present-day wake. Bible verses are read during this time.